From keeping a car clean to fixing a cracked windshield, car maintenance is an ongoing occurrence through the life of your vehicle. However, a recent iSeeCars.com survey found that many respondents aren’t afraid to let some car maintenance issues slide. Perhaps not very surprising but men seemed to be the bigger procrastinators in comparison to women. 26.5% of men (vs. 23.5% of women) acknowledged they delayed interior/exterior car cleaning, with 43.4% of men in the Midwest leading the respondents. Men were also the top respondents (16.8%) in postponing fixing a cracked windshield, versus women (11.9%). When it comes to overdue oil changes, 16.8% of women said they procrastinate versus 13.4% of men. That oil change response jumps to 38.5% of females vs. 11.1% of males when only looking at respondents with an income of $75-$99K. 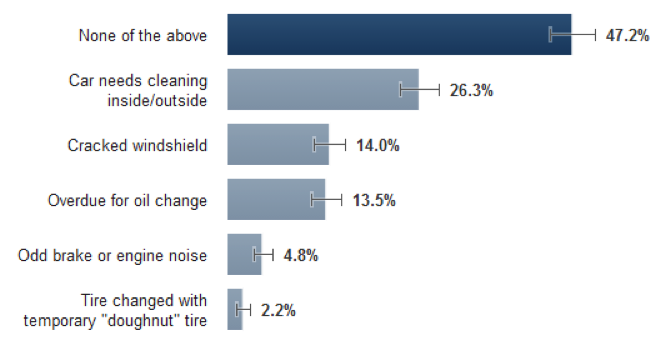 While delaying car cleaning, cracked windshield, and oil change may be understandable, we were surprised to find close to 7% of the people surveyed would put off things that may cause a hazard: fixing an odd brake or engine noise and continuing to drive a vehicle on a temporary tire. About the same percentage of men and women would delay looking into an odd brake or engine noise but twice as many men as women would delay replacing a temporary tire. iSeeCars is a car search engine that helps consumers find the best deal by providing key insights and analysis about each used car. The proprietary iSeeCars algorithm ranks cars by calculating an overall score based on analysis of the car’s condition, history, negotiability, price and the seller. Based in the Boston area, iSeeCars was founded by former TripAdvisor and SAP developers and executives who were frustrated with the used car shopping experience.